If you’re a pet owner, you’re going to have to ask yourself at some point is how important is it having a completely weed-free lawn? If you don't mind a few stray dandelions or a mallow patch here or there, you may not even need to spray for weeds. Good old fashion elbow grease may do the trick. If you are persistent about pulling or mowing weeds, they eventually stop growing or at least decrease in population. If you have a typical yard and not a high maintenance ‘show yard’, you may be able to keep weeds at bay just pulling them out of the lawn and placing mulch in your plants beds to prevent future weeds from growing. There are those low growing weeds that are a pain to pull and you just need a bit of help to get rid of them. For me, the worst are sand burs and thistle. So, you absolutely hate pulling weeds, you have animals and you want an alternative to getting on your knees and giving the ol’ heave hoe. I would first recommend a good dousing of boiling water or full strength vinegar. Both will kill most weeds. The only downfall to using boiling hot water and vinegar is that it can also kill desirable grass and flowers growing around the weed. Some people will add a bit of dish soap to the boiling water or vinegar so that it will be a bit thicker and not spread as much. I really don't think it works. to use only for gardening. Always be very careful while pouring the boiling hot water and what type of vessel you’re using. I recommend a pitcher or a pan with a lip on it so you’ll have better aim. 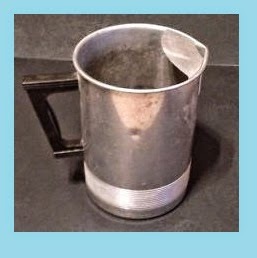 I have an old aluminum pitcher from the 40’s that I use. Any good spray bottle will work with vinegar. If your lawn has a lot of tough weeds like ones with burs or needles that are damaging when stepped on, you may have to use a herbicides even if your anti chemical. Some weeds are so invasive that they can wipe out a lawn and next a community. Junk bird seed bought at discount stores are known to have invasive weeds like musk thistle, cockle burrs or what have you. Always read the labels of bird seed and know your plants; otherwise, you and your neighbors will regret buying cheap bird seed. Herbicides are considered man made chemicals that will aggressively kill weeds. I recommend spot treating weeds with the non-selective herbicide glyphosate (Roundup or Milestone). Non-selective in the weed killing industry means that it will kill a variety of weeds. 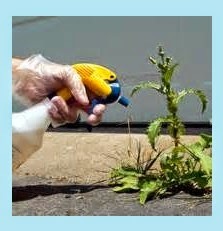 Besides using a spray bottle to administer weed killer, you can also use a paint sponge, spoon, syringe or straw. Always wear gloves. Don't let your skin come into contact with chemical herbicides. Be sure to aim carefully and you should be good to go. Spray the bottle first against a wall or something so, you can get a good idea of how the stream will come out. Whether you use boiling hot water, vinegar or a herbicide, be sure to pull the weed after its dead just in case it has seed pods on which will eventually replant itself. I always pull the weed, discard it and drench the ground a bit. When To Apply Weed Killer Spray? Spray plants during the hottest part of the day or when the sun is high in the sky for maximum results. It's a really good idea to keep your kids and pets away while treating weeds. 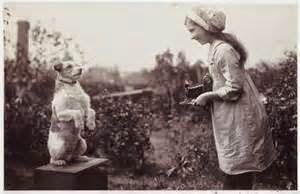 Both are curious creatures and most likely will want to see what you were up to. *Always remember that chemicals as like Roundup are easy to use but, those chemicals will also kill grass, flowers and can damage trees and shrubs through their roots. Most trees and shrubs have rooting systems that sprawl out, away from the actual tree or shrub. Be aware of where those root systems grow because, they can be damaged just like a weed. Always use weed killers with caution. If you use herbicides right, they are extremely effective, save you time and a backache. You'll want to keep at least one bottle of a good herbicide product in your garden shed. Most people don’t like pulling weeds because, it really is back breaking work. We all usually forget the proper way to bend or reach in order to avoid injuries. I keep a bottle of herbicide on hand mainly for reoccurring thistle. I hate thistle. I have a bottle of Milestone and Roundup in my garden shed. Both are good products. Be Careful When Spraying Chemicals! Here's an example of why you should know how to properly use weed killers. My new neighbor had used a harmful brand of weed killer on our fence line to kill weeds on her side. I think it contained alot of ammonia or something. She thought you just aim and shoot. Boy was she wrong. She over sprayed the entire area which bled into my yard. It pays to read the labels. Not only did my lovely neighbor kill the crab grass and other weeds but, she also killed the beautiful heirloom rose bushes (Baron Girod de L'Ain) that had been growing there for years and she killed my St. Augustine grass that was growing on the other side of her fence. It’s been one year and I still have trouble with the grass not re-growing like it did. According to researchers, glyphosate doesn't stay in the soil. It evaporates and dissipates when watered but, it will stay in the plant. I recommend keeping your pets out of the sprayed area until the foliage completely dries. Then pick the weed up the next day and toss it waste bin. As long as the dogs avoid exposure to the liquid itself, they're safe. I don’t recommend tossing weeds affected by chemicals into your compost or green waste. You just never know what it will do. Unless I’m pressed for time, I don’t mind pulling weeds. Gardening is also a form of exercise, relaxation and stress relief for me. I like to reward myself with a lovely cocktail after a day of pulling weeds. I have noticed after time of having a regular practice of pulling weeds that they eventually de-populate .. . that's until the California Santa Ana winds decide to blow the next batch of weeds seeds onto my property. Safe organic herbicides are now called “Sustainable Viticulture”. It’s basically organic herbicides made from acetic acid like vinegar, citrus or corn gluten meal. They rob plants of its fatty acids and flash dehydrate them. Corn gluten meal comes from processing corn syrup and corn starch. It’s commonly used as a safe “Weed and Feed” and it’s edible accept for folks with Celiac Disease (gluten issues). When sold as a herbicides it will usually have a bit of lemon juice in it for extra killing power. Corn gluten is safe around pets and it’ll also fertilize the ground. There’s a book titled “The Lawn Bible” by David R. Mellor who has a lot of good ideas about using organic ingredients as like vinegar or corn gluten, hot water in lieu of dangerous chemicals. 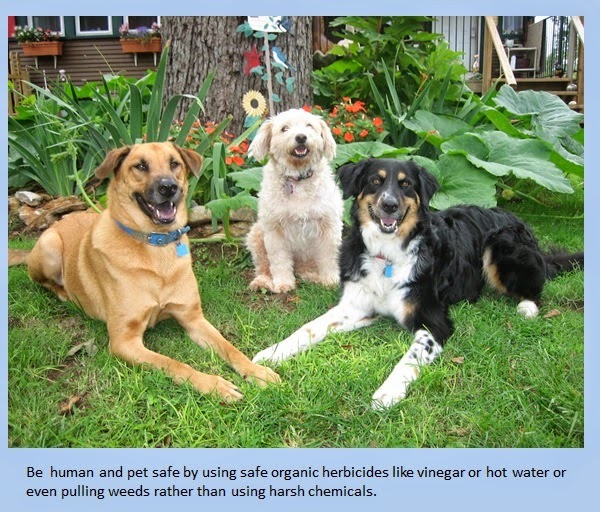 Other pet friendly herbicides to look for are herbicidal soaps, essential oils as like eugenol, corn gluten meal, clove oil, d-limonene, lime, borax, Milestone, Tordon, corn starch, vinegar, lemon juice, salt, dish soap, corn meal, in some cases sugar spices, household Clorox bleach, or even citrus oils. Different methods for different weeds. Planting more grass will also choke out most weeds. Amazon.com has many organic herbicides listed or you can find these at well stocked garden nursery or home centers. Some mom and pop nurseries will be glad to order products for you. When you go to buy a pesticide that’s safe for your pets, I recommend asking a store employee, read labels and do your research! When it comes to your pets.. . Safety first! Look on the label to see if it has EPA - Environmental Protection Agencies seal of approval. I'm not a big fan of chemicals imported from other countries as well. I think it's best to use chemicals manufactured in your own country as so consumer laws can protect you, your family and pets.